Sydney, April 16, 2014 Monster Health Food Co. (MHFCo. 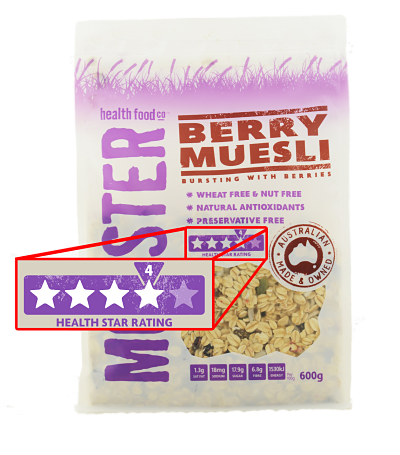 ), an Australian-made and family-owned breakfast food company, has today launched Australia’s first products to display a Health Star Rating on its packaging. The new front-of-pack labelled products will be on supermarket shelves from this week. The first two products introduced each have a Health Star Rating of 4 out of 5 stars. The Health Star Rating system was developed by industry, consumer, and public health groups with support from government. The Health Star Rating gives an overall indication of a food’s nutritional quality and additional information that provides an overview of the key nutrients within the product – such as salt, fats, sugars and fibre – so consumers have an easy-to-reference guide. The higher the Health Star Rating, the better the nutritional balance. In an increasingly time-poor society, the Health Star Rating provides an authoritative source on what’s included within a chosen product, enabling consumers to compare products like-for-like on a nutritional basis and make informed choices. With a roll-out period beginning in July this year, and then a two-year voluntary period before the industry is seeking full implementation, MHFCo. is pressing ahead to demonstrate its strong support of the Health Star Rating system. They hope it inspires other companies to follow suit to ensure transparent, easy-to-understand food labelling for Australian consumers. “We believe the system alsocomes at a time where consumers are more conscious about their food choices,and more sceptical of health claims such as ‘99% fat-free’,” Mr Lauman says.“The Health Star Rating will provide an honest snapshot of what is contained within each product.